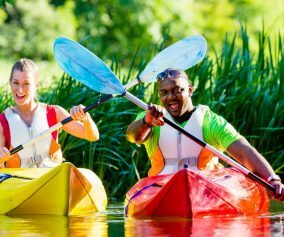 Are you new to water sports? Do you want to go on a water adventure? Are you hesitant about spending too much money? Intex inflatable kayaks are the best and cheap way to paddle your way through water. Most kayaks are made of durable PVC so don’t worry about the strength of material of differently priced kayaks, just enjoy the savings! 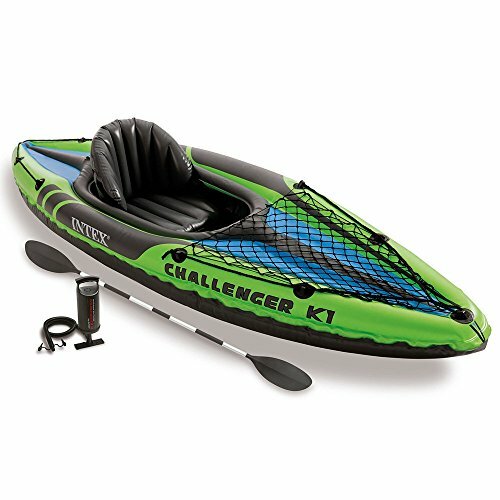 Why is the Intex Challenger K1 Kayak the best? One simple reason, it is cheap and comes with all the basic accessories that you would need for your kayaking trip i.e. a kayak, a paddle, pump and a kit in case your kayak gets damaged. Since it has a low profile design, Challenger K1 works best in mild rivers and lakes. The kayak is streamlined and built to carry only a single passenger. The comfortable backseat allows an easy paddling experience without tiring quickly. It is made of really strong and excellent quality vinyl, usually found on expensive kayaks. The repair kit also has a patch in case of any accidental ripping. The inflatable I-beam floor provides additional toughness. The kayak is about 9-feet long and weighs a mere 24.6 pounds, but the kayak can astonishingly handle 200lbs of body weight. One of the best features of the Challenger is that it is made of five separate inflatable chambers. 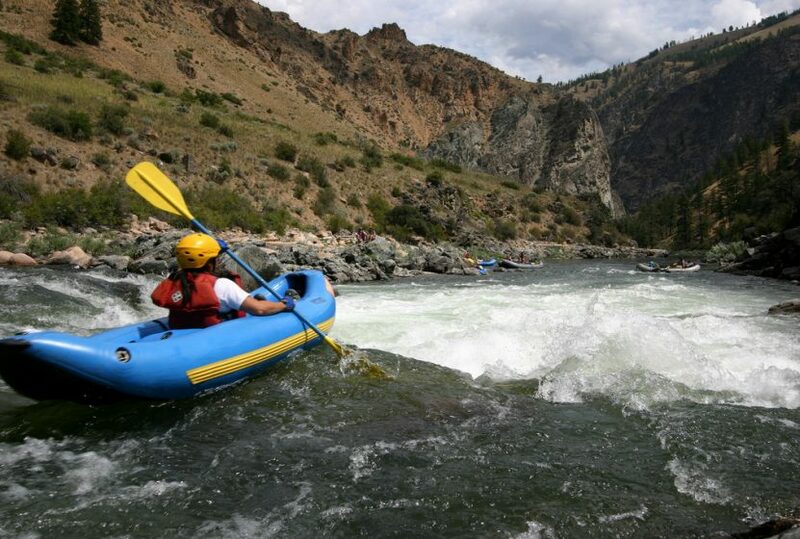 This means that your kayak will still be a float even if one of the chambers is punctured. The space in front allows you to store your gear which is a lot better than tying your gear with a bungee cord. Since it is a sit inside kayak, you will remain completely dry during the water ride. Deflating the kayak is also not a problem and hardly takes about 5 to 10 minutes. The kayak is very stable but stability also greatly depends upon the experience of the driver. On the other hand, since it is smaller in size as compared to the expensive kayaks so tracking straight can be a little problematic. The Intex Explorer K2 Kayak is perfect if you do not wish to enjoy the fun water adventure alone. It is a dual seat kayak with adjustable back rest to allow you and your partner to explore waters for a long time without tiring. The streamline design offers excellent paddling experience thus hooking you to kayaking forever. 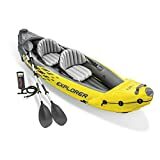 Explorer K2 has been designed in bright colors and sporty graphics which makes it easy to spot the kayak in water even from a long distance. The kayak is lightweight and compact, so carrying it is not a problem. It has been designed for slow moving rivers and lakes, therefore carrying it in rough waters may damage permanent damage. Like the Challenger K1, Explorer K2 is also made from rugged vinyl that is wear and tear proof. The packaging also includes a repair kit incase the kayak gets impaired. The I-beam floor provides security and firmness. A Boston valve on each side allows quick inflating and deflating. 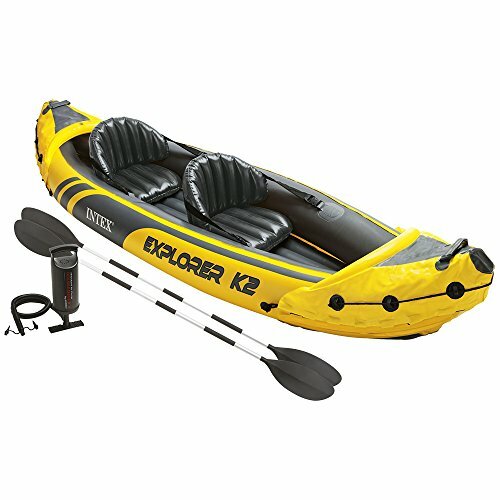 The Explorer K2 kayak comes with two oars, a repair kit as well as an inflating pump. With all the basic accessories included, all you need to do is head out to waters and enjoy kayaking!